To help combat a marked increase in gun-related crime in our community, Champaign County Crime Stoppers announced a 3-month pilot program called the Gun Bounty Reward on January 10, 2019. Through this initiative, anyone who contacts Crime Stoppers with a tip that leads to the arrest of person who used a gun during the commission of a felony crime in Champaign County will receive our maximum $1,000 cash reward pay out. Now halfway through the pilot program, Crime Stoppers is pleased to announce the successful outcomes that have resulted from the Gun Bounty Reward. In order to maintain this type of success, and to continue the Gun Bounty Reward program past the three-month pilot program, Champaign County Crime Stoppers needs the financial support of local businesses and members of the public. Crime Stoppers has no paid staff and relies upon the support of our community for reward money and operating expenses. The success of the Gun Bounty Reward program has increased our need for financial assistance from the community we serve. Members of the public are asked to support Crime Stoppers with a tax-deductible donation which can easily be made via our website - 373tips.com. As always, tips must come directly to Crime Stoppers in order to qualify for a reward. Tipsters will remain completely anonymous and can submit tips by phone (217-373-TIPS), our website (373tips.com), or through our free “P3 Tips” mobile app. More than 100 times in 2018, police in Champaign, Urbana, Rantoul, and Champaign County responded to reports of "shots fired." Nine people died as a result of their injuries in 2018; seven in Champaign and two in Urbana. In total, 2018 Champaign County crime statistics show there were 125 substantiated shooting incidents based on police verification that a gun was fired through shell-casings, property damage, injuries, or even death. To help combat a marked increase in gun-related crime in our community, Champaign County Crime Stoppers is launching a 3-month pilot initiative called the Gun Bounty Reward. 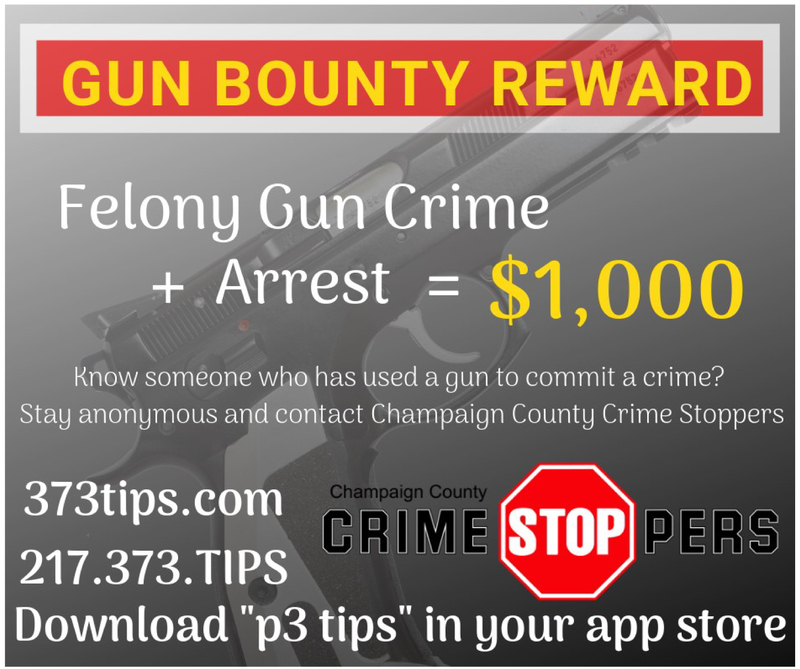 Anyone who contacts Crime Stoppers with a tip that leads to the arrest of person who used a gun during the commission of a felony crime in Champaign County will receive our maximum reward pay out - $1,000. In other words, Felony Gun Crime + Arrest = $1,000 Reward. police solve crimes and make arrests. As always, tips must come directly to Crime Stoppers in order to qualify for a reward. Tipsters will remain completely anonymous when submitting a tip to Crime Stoppers by phone at 217-373-TIPS (8477), via our website at 373tips.com, or through our free P3 Tips mobile app. In 2018, Crime Stoppers of Champaign County received more than 1,200 tips which led to the arrest of 51 people, the payout of nearly $6,000 in rewards, and the recovery of more than $19,000 of drugs, cash, and stolen property. Since our program was founded in 1986, Crime Stoppers has processed nearly 21,000 anonymous tips, recovered more than $1.5 million dollars of drugs, cash, and stolen property, and paid out more than $126,000 in cash rewards. Crime Stoppers works! Crime Stoppers is committed to making Champaign County safer by providing an easy way for tipsters to convey information anonymously and to receive cash rewards for information that leads to an arrest. Crime Stoppers has no paid staff and relies upon the support of the community for operating expenses and reward money. This enhanced reward opportunity increases the need for our organization to seek public donations in order to continue the success of our program. Businesses and members of the public are encouraged to consider making a donation though the link on our website at 373tips.com. Crimes Stoppers of Champaign County today announced the winner of the Fourth Annual Dave Benton Crime Fighter of the Year Award at the organization’s Annual Meeting held at the Elks Lodge in Savoy. Also, the recipient of the Crime Stoppers Criminal Justice Scholarship was announced. The winner of the Annual Crime Stoppers Criminal Justice Scholarship is Breahna Ramirez. She was graduated from Centennial High School in Champaign and plans to use the $2,000 scholarship toward her education at Parkland College. She hopes to pursue a career in Corrrections Institutions. The underlining purpose of this scholarship program is to promote criminal justice as a career and to financially assist a graduating senior in pursuit of an education in that field. This year's scholarship was made possible, in part, by Doug Mills. The deadline is approaching to nominate someone for the fourth annual Dave Benton Crime Fighter Award. This annual award was established in 2015 by the Board of Directors in honor of former board member and WCIA-TV anchor Dave Benton. The intent is to recognize a Champaign County citizen who most exemplifies the crime-fighting spirit that Dave Benton exhibited during his award-winning newscasts, programs, and during his tenure as a member of the Crime Stopper’s Board of Directors. He lost his battle against cancer in May of 2015. Nominations are open to all residents of Champaign County. A nominee should be an individual who has made a difference in the fight against crime. This person must have been involved in an on-going activity or program that helped to stop a crime, solve a case or made a big difference in resolving a dangerous situation that made their neighborhood, community or Champaign County safer. The Fourth Annual Dave Benton Crime Fighter Award will be presented during the Annual Meeting of the Board of Directors in July. The deadline to submit nominations is June 1st. Nomination Forms can be found on the Crime Stoppers website at 373tips.com. Printed forms are also available at the front desks of area police departments, and at the Sheriff's Office. The winner will also receive a monetary award of $500. Administration (D.E.A.) are joining together to provide a one-stop opportunity for residents to protect themselves from identity theft and to safely dispose of old prescription drugs. Crime Stoppers is sponsoring a Shred Event in conjunction with a D.E.A. 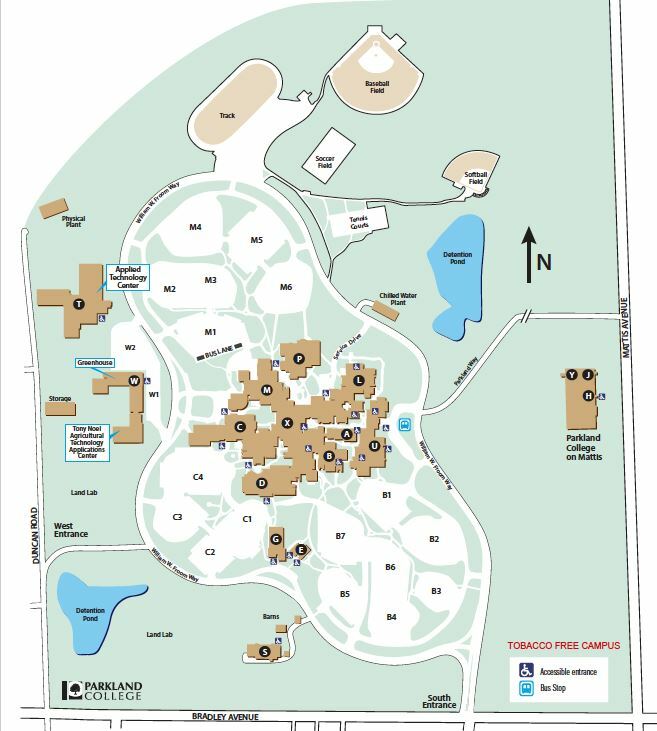 free Drug Drop-Off on Saturday, April 21, 2018,from 9 a.m. –12 p.m., at Parkland College in Champaign. The events will be held in parking lot M, and participants should enter from Duncan Road. (SEE MAP). The best way for people to protect themselves against identity theft is to make sure their personal information doesn’ fall into the wrong hands. Shredding old personal documents can get rid of the potential risk permanently. Crime Stoppers is working with Triad Shredding to provide off-site shredding of up to 5 banker’ boxes of documents to help residents protect themselves. Crime Stoppers is also asking for a small donation of $5 to help pay future rewards to tipsters who help solve crimes. The following documents will be accepted: medical records, financial statements, credit applications, bank statements, documents with social security numbers or driver license numbers, bank checks, tax records, and legal documents over 8 years old. At the same time, the D.E.A. is offering an easy way to prevent pill abuse and theft through the Drug Drop-Off. Residents can rid their homes of potentially dangerous expired, unused, and unwanted prescription drugs. People can bring their pills and patches, and the D.E.A. will also accept liquids as long as they are in leak-proof or sealed containers. But the D.E.A. cannot accept needles or sharps. The service is free and anonymous, no questions asked. This initiative addresses a vital public safety and public health issue. Medicines that remain in home cabinets are highly susceptible to diversion, misuse, and abuse. In addition, usual methods for disposing of unused medicines such as flushing them down the toilet or throwing them in the trash, pose potential safety and health hazards. More information about the Shred Event and Prescription Drug Take Back is available at 373-tips.com. Crimes Stoppers of Champaign County today announced the winner of the Third Annual Dave Benton Crime Fighter of the Year Award at the organization’s Annual Meeting held at the Elks Lodge in Savoy. Also, the recipient of the second Crime Stoppers/Busey-Mills Community Foundation Criminal Justice Scholarship was announced. criminology program. The underlining purpose of this scholarship program is to promote criminal justice as a career and to financially assist a graduating senior in their pursuit of an education in the field of criminal justice. Crime Stoppers of Champaign County is proud to announce the winner of the Third Annual Dave Benton Crime Fighter of the Year Award at its Annual Meeting to be held on July 26, 2017 The award is given to a citizen of Champaign County who most exemplifies the crimefighting spirit that Dave exhibited during his award-winning newscasts and programs on WCIA-TV, and as a Crime Stoppers board member. Dave lost his battle against cancer in May 2015. Also during the Annual Meeting, the winner of the second annual Crime Stoppers/Busey-Mills Community Foundation Criminal Justice Scholarship will be introduced. Members of area law enforcement agencies are among the invited guests. The Guest Speaker is Dr. Michael Schlosser, Director of the Illinois Police Training Institute. The Annual Meeting will be held from 12 to between 1-1:15, July 26, at The Elks Lodge, 903 North Dunlap, Savoy. The winner of the Dave Benton Crime Fighter Award, the person who nominated the recipient, and John Hecker (President of the Champaign County Crime Stoppers) will all be available to the media following the meeting. Crime Stoppers of Champaign County and the U.S. Drug Enforcement Administration (DEA) are joining together to provide a one-stop opportunity for you to protect yourself from identity theft and to safety dispose of old prescription drugs. Crime Stoppers is sponsoring a Shred Event in conjunction with the DEA’s National Prescription Drug Take Back Day on Saturday April 29, 2017, 9-11am, at the southwest corner of St. Mary’s Road/Fox Drive and Neil Street, in Champaign. The best way to protect yourself against identity theft is to make sure your personal information doesn’t fall into the wrong hands. Shredding old personal documents can get rid of the potential risk permanently. Crime Stoppers is working with Triad Shredding to provide off-site shredding of up to 2 banker’s boxes of documents to help you protect yourself. Crime Stoppers is also asking for a small donation of $5 to help pay future rewards to tipsters who help solve crimes. At the same time, the DEA will give you an easy way to prevent pill abuse and theft through the Drug Drop Off. You can rid your home of potentially dangerous expired, unused, and unwanted prescription drugs. Bring your pills and patches, but the DEA cannot accept liquids, needles or sharps. The service is free and anonymous, no questions asked. This initiative addresses a vital public safety and public health issue. Medicines that remain in home cabinets are highly susceptible to diversion, misuse, and abuse. In addition, usual methods for disposing of unused medicines—flushing them down the toilet or throwing them in the trash—both pose potential safety and health hazards. For more information about the Shred Event and Prescription Drug Take Back Day is available at 373-tips.com. Crime Stoppers is partnering with Texas-based Anderson Software to provide the upgrade in technology to better meet the needs of smart phone users. Anderson Software leads the industry with its latest secure and anonymous tip acquisition and management solution, called P3 Intel. This partnership allows Champaign County to foster a relationship between law enforcement and the public to proactively create safer neighborhoods. Crime Stoppers of Champaign County will continue to accept tips at our TIPS phone line 373-TIPS, and at our website 373tips.com. But tips will no longer be accepted via SMS text messages. Instead, tips will be accepted through the new free P3 Tips mobile app available on the iOS and Android platforms, greatly enhancing the mobile tip submission process. Still completely anonymous, tips submitted through the P3 mobile app, unlike SMS text tips, have no length limitations and allow images, video and documents to be uploaded with the tip. Anderson Software’s sophistication encryption processes obscure any and all identifying information and provides assured anonymity for tipsters. Crime Stoppers of Champaign County is very proud to announce that our former Law Enforcement Coordinator, Troy Daniels, has been named as the recipient of the highest honor awarded by Crime Stoppers USA. 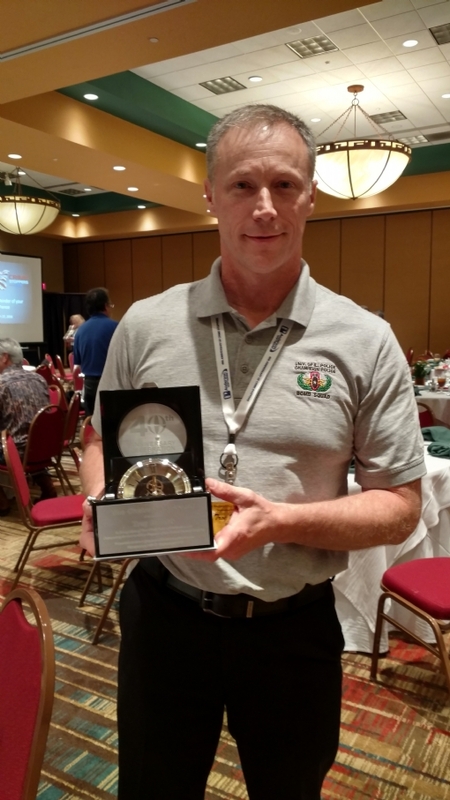 Daniels, who serves as Deputy Chief of the Champaign Police Department, received the Chairman's Award, on September 27, 2016, at the Crime Stoppers USA Conference held in Albuquerque, New Mexico. John Lamb, former chairman of Crime Stoppers USA, nominated Daniels for the award to recognize Daniels’s work for Crime Stoppers throughout his career. He said, "Troy Daniels has gone above and beyond on the national level for Crime Stoppers. That is what the award recognizes. He has sacrificed his time and energy on trips to Washington DC and multiple meetings with Congressmen and Senators as well as White House Officials trying to make this country a safer place to live. I also chose him because of his level of commitment to the organization." "It’s been my honor and pleasure to work with these men and women from across the country with Crime Stoppers USA", Deputy Chief Daniels said. "I feel Blessed to be able to work with something I really believe in and I know Crime Stoppers helps a lot of people stay safe by keeping them anonymous. There have been a lot of people arrested through Crime Stopper tips that would not have been arrested without Crime Stoppers." Daniels served as the Law Enforcement Coordinator for Crime Stoppers of Champaign County for 15 years, and continues to serve as an advisory member to the Board of Directors. "We are extremely pleased that Troy has received national recognition for his work that has moved the Crime Stoppers program forward on a local as well as a national level", said John Hecker, President of the Board of Directors of Crime Stoppers of Champaign County. "Troy has been a tireless leader for the betterment of the program and richly deserves this prestigious award." Crime Stoppers of Champaign County today announced the winner of the Second Annual Dave Benton Crime Fighter of the Year Award at the organization’s Annual Meeting held at the Urbana Country Club. Also, the recipient of the first Crime Stoppers/Busey-Mills Community Foundation Criminal Justice Scholarship was announced. The winner of this year’s Dave Benton Crime Fighter of the Year Award is Jorden Moore, who as a mentor to a young girl who was legally adopted by her foster parents, was told by the girl that she had been sexually abused by her adoptive father Daniel Baltierra over a period of years. When Moore learned Baltierra denied the abuse, the girl’s mother hid the abuse from investigators, and had instructed her daughter to mislead authorities, Moore made a commitment to expose the sexual abuse, including recording conversations where the crimes were discussed. Moore’s actions led to a confession by Baltierra and to his eventual felony conviction of Predatory Criminal Sexual Assault of a Child. He was sentenced to 30 years in prison on the Class X Felony in May, 2016. Jorden Moore was nominated by two investigators with the Champaign County Sheriff’s Office who worked the case, Sgt. Christopher Darr and Investigator Dwayne Roelfs (pronounced rollfs). In their nomination, they stated that Moore’s actions ultimately led to the re-examination of the suspect and to his conviction. They also said, "Moore initially volunteered to mentor a young girl in our community which then led to her protecting and pursuing justice for that girl. We would like to thank Jorden Moore for making our community a better place with her positive character, sound integrity, and commitment of protecting children." The Dave Benton Crime Fighter of the Year Award was established by Crime Stoppers of Champaign County in 2015 in honor of the late WCIA-TV anchorman Dave Benton for his crime-fighting spirit exhibited during his award-winning newscasts and programs and as a Crime Stoppers board member. Dave lost his battle against cancer in May, 2015. The winner of the 1st Annual Crime Stoppers/Busey-Mills Community Foundation Criminal Justice Scholarship is Chloe Buttry, a 2016 graduate of Centennial High School in Champaign. She will attend Parkland College this fall, majoring in Criminal Justice. As part of the application process, Buttry wrote a personal essay and submitted two letters of recommendation. The underlining purpose of this scholarship program is to promote criminal justice as a career and to financially assist a graduating senior in their pursuit of an education in the field of criminal justice. Members of area law enforcement agencies are among the invited guests. Plus, this year’s guest speaker is long-time News-Gazette reporter Mary Schenk, who covers crime and courts and “breaking news” for the newspaper and website. The Annual Meeting will be held from 12-1:30 p.m. on July 28, at the Urbana Country Club, 100 E. Country Club Road. The winner of the Dave Benton Crime Fighter Award, the person who nominated the recipient, and John Hecker (President of the Crime Stoppers Board of Directors) will all be available to the media during a news conference to be held on the front lawn of the Country Club immediately following the meeting. Today (6/12/2016) at approximately 5:10 PM, Champaign Police Officers and Detectives arrested 37-year-old Peter L. Campbell, who was wanted for the June 10,2016, Holly Hill Drive shooting of a Champaign woman. An anonymous Crime Stoppers tip led Police to the 2700 Block of Wellington Drive. As officers approached the home, Campbell attempted to flee from the residence through a back window; however, Police were able to apprehend the subject before flight, and without incident. Campbell was transported to the Champaign County Jail for the offense of Aggravated Discharge of a Firearm. Bond is set at $150,000. In addition to the arrest of Campbell, Police also arrested 21-year-old Raekwon Collins and 21-year-old Marcus Merriweather who were both wanted in Vermillion County on unrelated outstanding arrest warrants. Police officials greatly appreciate the community’s partnership in this ongoing investigation and continue to encourage anyone with information to call the Champaign Police Investigations Division at (217) 351-4545 or Crime Stoppers at (217) 373-8477. The Illinois State Crime Stoppers Association Annual Conference will be held in Champaign June 9-11, 2016. The conference is being hosted by the Champaign County Crime Stoppers at the Hyatt Place hotel in downtown Champaign. Approximately 100 guests from Crime Stoppers organizations across the state are expected to attend the conference to exchange ideas, network, and learn about new ways to promote Crime Stoppers in their communities. In addition to hosting this year’s state conference, Champaign County Crime Stoppers is celebrating its 30th anniversary with a Murder Mystery Fundraiser on June 9th. The event is called “Maybury DOA” and follows a Barney Fife-like character as he attempts to unravel the mysterious happenings in his once peaceful town. This fun event is open to the public. Tickets are $50 each and a limited number are available for purchase at 373tips.com. In celebration of 30 years of service to our community, Champaign County Crime Stoppers invites the public to a unique night of fun and mystery. Attend Crime Stoppers’ Murder Mystery Fundraiser on June 9, 2016, starting at 6:30 pm at the Hyatt Place Hotel in downtown Champaign. Tickets are $50 each and available for advanced purchase at 373tips.com. The case: Maybury DOA –Usually, not much happens in Maybury, but lately life has been a bit different. In the past week, there’s been an infestation of rats, a fiery car crash, an accidental shooting, and a long-awaited engagement. What more could happen? Oh, that’s just the beginning for this evening of raucous fun like you’ve never seen, especially not on TV. Presented by the Champaign-Urbana Theatre Company. Event ticket includes heavy passed hors d’oeuvres and one specialty drink per guest. Limited number of event tickets available. Order at 373tips.com. John Hecker will received the Local Hero Award from the 2016 Champaign-Urbana Schools Foundation at their recognition gala on April 2, 2016. Hecker is a 1969 Central High School graduate, with John Gnagey, founded the Champaign County Crime Stoppers organization in 1986 to help police solve crimes by way of tips provided by the public. He served as the first president and continues to serve in that position. With Hecker's leadership, the organization has solved more than 1,600 cases and is now considered one of the finest Crime stopper organizations in the country. Nominations are open to all residents of Champaign County. A nominee should be an individual who has made a difference in the fight against crime. The individual must have been involved in an on-going activity or program that helped to stop a crime, solve a case or made a big difference in resolving a dangerous situation that made their neighborhood, community or Champaign County safer. The Second Annual Dave Benton Crime Fighter Award will be presented during the Annual Meeting of the Board of Directors in July. The deadline to submit nominations is June 1st. Nomination Forms can be found here on the Crime Stoppers website. Printed forms are also available at the front desks of area police departments, and at the Sheriff's Office. The winner will also receive a monetary award of $500. For further information, contact the President of the Board of Directors, Crime Stoppers of Champaign County, John Hecker at 217-356-8391. Champaign County Crime Stoppers thanks Busey Bank for their recent donation of $735 to our organization. 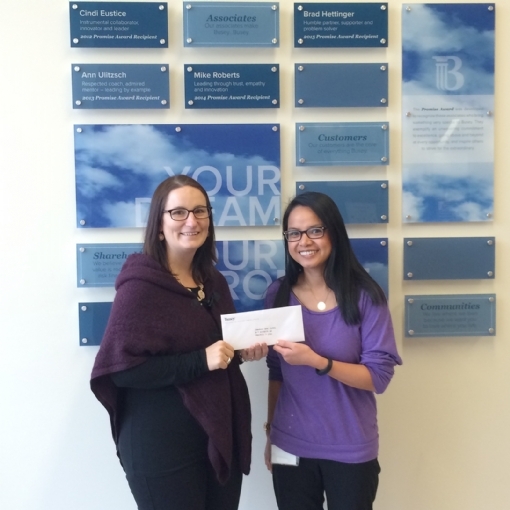 Busey raises proceeds from a "Jeans Day" then donates the money to local non-profits. We are honored to be one of this years recipients. Thank you Busey! Crime Stoppers organizations in Champaign, Bloomington, Decatur, Peoria, and Florida all received donations. Dawn Coyne (left) of Champaign County Crime Stoppers receives a check from Mitzi Villalon - Busey Pillar Relations associate. More information, including registration information coming soon! Crime Stoppers of Champaign County today announced the winner of the First Annual Dave Benton Crime Fighter of the Year Award at the organization’s Annual Meeting held at the Champaign Country Club. The winner is Michael Hao of Lake Zurich, Illinois. The University of Illinois junior impressed the Selection Committee by combining his long-term commitment to fighting crime with his skills as a Computer Engineering major. The Committee believes Michael most exemplifies the crime-fighting spirit exhibited by WCIA-TV anchorman Dave Benton during his newscasts and programs, and during his tenure as a member of the Crime Stoppers Board of Directors. Dave lost his battle against cancer in May. Michael Hao is a member of the Student Patrol Program, which is an organization that developed the SafeWalk Program. Safe walks are offered to students, faculty and staff on campus during evening and late night hours to reduce the chances they could become a victim of a crime by walking alone. Michael said “this experience has not only taught me general programming skills, but it has more importantly shown me that these skills can be used to make our lives safer. I am very grateful to have had an opportunity to be part of something like this”.